ASHA was very pleased to welcome a group of final year medical students tasked to visit the centre weekly to familiarise themselves with the ‘world’ of asylum seekers as part of learning about local community services. We are always curious to know how others see us and to learn from the experience of visitors. This is how one medical student describes arriving at ASHA. ASHA’s clients felt very much at ease with the students as they discussed the issues they have approaching the medical services in a new country. The outcome of the student’s visits is a beautiful printed leaflet, A Guide to Using the NHS, which in simple language and symbols will help an asylum seeker know where to get help and how to tell a doctor or pharmacist about their symptoms..
ASHA is pleased welcome a second group of medical students and looks forward to their insights into how the centre works and their insight into what matters most for our asylum seekers. The event was delivered by project officers, Matt Pointon and Mark Rowe and was attended by 29 ASHA service users. Another session discussed work and the role of trade unions and most of the information was completely new to the participants. They had heard about trade unions but were amazed at their actual role and importance in the workplace. When the time arrives to apply for a job an asylum seeker will be better equipped about the world he is moving into. There was a lively session on ESOL which was of particular benefit for participants who are not yet eligible to enrol for English classes. ASHA is very grateful to Matt and Mark for their inspiring leadership and very pleased that another learning day is on the cards for February. Finally, a bonus is that the cost of the day includes a budget for ASHA to supply lunch. On this occasion, Manjula cooked a lovely curry plus accompaniments and this added a gloss to the whole occasion. 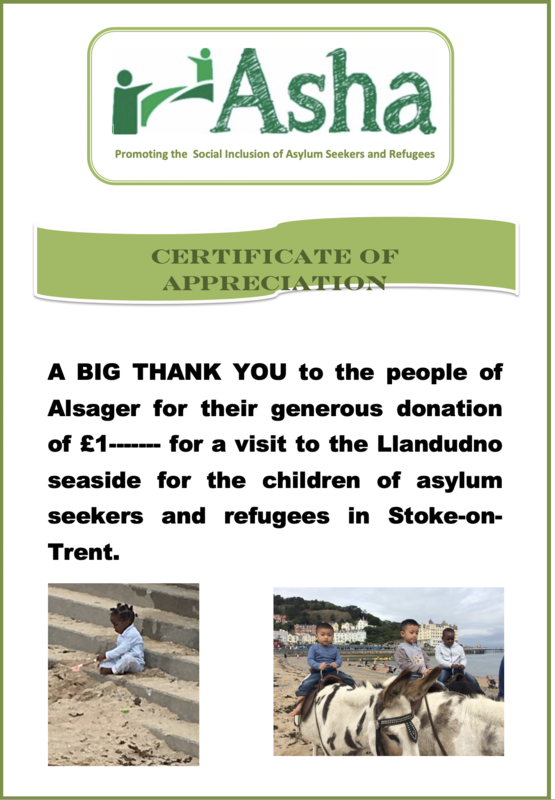 ‘One of the first connections we made was with ASHA, a local organisation in Stoke-on-Trent that works with refugees and asylum seekers coming into the city. It support hundreds of individuals and families from a range of countries who are in need of acute and long-term help. Most of the people who use their services arrive in the UK with nothing and need basic necessities such as food and clothing. Our SVP work has involved organising monthly congregational collections of these and the generosity of our congregation has been overwhelming. It is always a pleasure to drop off the itens which are clearly appreciated. Father Michael also kindly donated £700 raised from a classical concert he organised in church which helped to replenish ASHA’s food supply. Some of our group have helped teaching English and attended a course in conjunction with Keele University to ensure they understood the criteria for engaging in this activity. ‘I also personally helped a young boy who had arrived from a Balkan country to get involved in a local football team as he did not know how to develop his love of and his talent for football. POST SCRIPT Father Michael had another concert arranged for 9 December to raise money for ASHA but this was the weekend when much of the city ground to a halt due to snow and storms. We understand that concert is to be rescheduled, possibly in the spring. Many are obliged to walk long distances to their destinations often in inclement weather. Finding the money to travel by bus even once a week can make a huge dent in the £37 per week each receives while waiting for their claim to be processed. ASHA has found that providing recycled bicycles has been a great solution for many and as fast as the bikes come in and are checked and repaired, then they are found new homes almost immediately. There is always a waiting list, which currently stands at around 20 +. Checks and repairs are carried out in house by Kirill, an asylum seekers who had a successful career as a highly skilled engineer in his home land. See him here in his temporary, makeshift ‘workshop’ in the corner of one of the large rooms at ASHA. Nothing is more guaranteed to bring a smile to his face than the delivery of another bike to make roadworthy again. Over the last year around 50 bikes have been donated from across North Staffordshire. You may have had a new bike for Christmas and don’t know what to do with the old one or you just haven’t got round to sorting out the one in the garage. If you have a spare bike in whatever condition (some past their best can be used for spare\parts) and want to do your bit to help asylum seekers and free up space at the same time, do get in touch with ASHA or, if you live in Staffordshire Moorlands, with Maureen Wisken on 01538 -285799 (07763-871-092). It helps enormously if you can deliver a bike but if this is not possible we will find someone to do so. These four young people were thrilled to receive two bikes between them. ASHA takes special care giving a bike to a young person because it is important to know that they will be supervised and have a good understanding about cycling safely and looking after their bike. ASHA moved into Unit 7 just under two years ago. These two years have been something of a roller-coaster but the second half of 2017 was one of consolidation and we embark on 2018 with great expectations. Our May conference brought together ASHA, the Jubilee Project and Sanctus to mark Refugee Week. Over 60 people attended and feedback confirmed that it was as successful as we thought it was and this was in no small measure due to our chair, Phil Mayland. The summer trip to Llandudno could not have happened without Maureen Wisken’s energy. 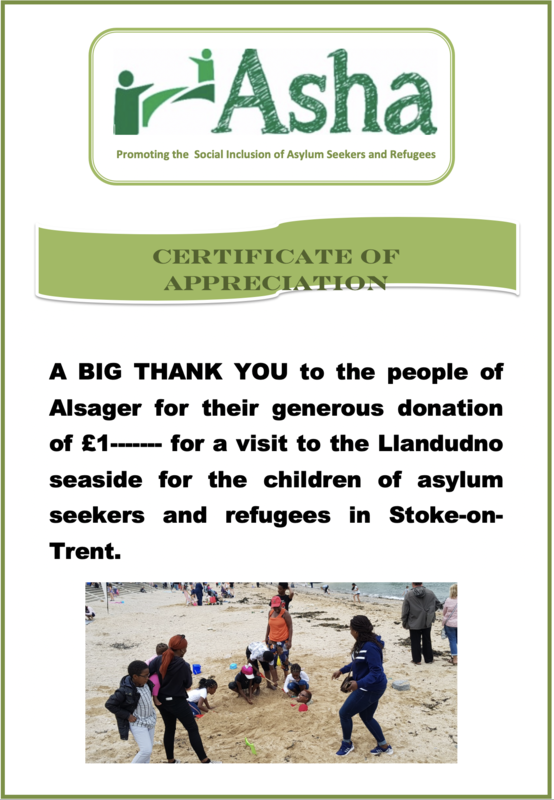 She rallied Trinity Church in Leek and various Methodist churches to raise money to hire two coaches and round up volunteers to share a day by the seaside with ASHA users. Maureen’s dynamism was not exhausted. 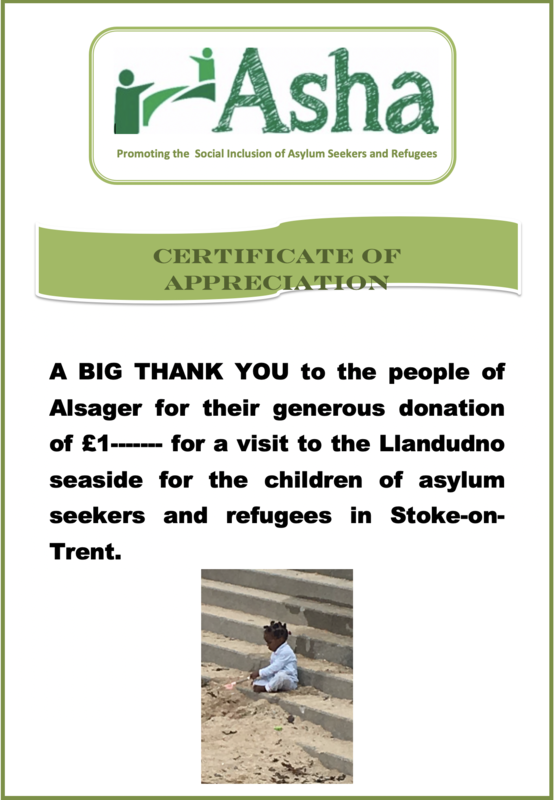 She also involved asylum seekers in cooking for Trinity Church’s Christmas Market which raised £2379.25 for ASHA. ASHA would not be what it is without the weekly presence of the British Red Cross offering support, advice and advocacy to asylum seekers and we are glad that Red Cross worker Charlotte Swan is with us this evening. ASHA is indebted to Barbara James who introducedKeele University English students and medical students to ASHA and we are glad Russell Clark, AcademicEnglish Programme Director, has been able to join us. We also have a core group of one-to-one English tutors who offer personal attention to those with little or no English. Margaret Yates is one of them and she is with us. ASHA has enjoyed several Community Learning days tutored by Matt Pointon and funded by the trade union, Unite. We owe David Wright and Peter Till, managers respectively of Newcastle and Lichfield Food Banks for their regular donations of surplus food. Stoke Food Bank does not often have much surplus to disperse but does so when it can. Manager Anna has recently moved to another job and Corinne Boden is here in her place. Thank you Phil Mayland and Carol Lovatt for your commitment in keeping the needs of asylum seekers to the forefront amongst various Roman Catholic congregations. Newcastle Unitarian Church regularly deposits food and clothing in my porch and various individuals and faith groups do the same. We are also very grateful to the Salvation Army who come through every Christmas with presents for the children. Theresa Raffan has taken on the hefty task of collecting the toys for distribution and Theresa attended the Christmas Party and is with us tonight. This year’s Children’s Christmas Party was attended by 138 children and 68 parents. Each year Sporting Communities organises the party and for over 10 years members of Keele World Affairs have contributed food and money. ASHA is fortunate that Ben Rigby, Director of Sporting Communities is a member of our Board of Trustees. We are glad to welcome guests, Sarah Wilshaw and Elaine Goldstraw from the NHS Asylum Seeker & Refugee Mental Health Team and Jude Hawes, Citizens Advice with Zak, Assistant Manager in the Asylum Advice Team and Shug from the Into School project. We’re sorry Huda and Chris can’t be with us. Show me a charity which can boast such a dedicated, hard-working staff as Godefroid and Lydia. They both work beyond the call of duty and they keep us grounded in our aim to be of service to men, women and families seeking refuge from persecution. We are also delighted to have Jane Bailey as our new finance and admin officer. Thank you to Kevin Sauntry and our Board of Trustees but above all, thank you to our local volunteers John, Maureen, Eva, Sarah, Dawn, Diane and Sylvia and our asylum volunteers Roza, Osman, Dabashish, Manjula, Monis, Jeanine, Sasangi, Kirill, Mansoora, Sirwan, Mamadu and Guillaume. Without them we would not be able to keep the show on the road. This occasion is especially for them, to show our appreciation of the way they rise above the stress and pressure of their situation to join us in offering services and care to those who have known such hardship, separation and loss. You give us hope and a renewed faith in humanity. Thank you. The day began with ESOL classes on points of grammar, delivered by Project Worker Matt Pointon, who is an experienced ESOL teacher. Neil then delivered sessions on IT including using government websites, rights at work and the reasons to join a trade union. Asha believes that it is important that our volunteers are remunerated for their work. This is why Asha pays towards the cost of their travelling to the Centre from outlying neighbourhoods as well as a small lunch allowance. We believe that volunteering for Asha or attending the Women and Children’s clubs may for many be a crucial first step towards becoming integrated in their local community. Since Easter the theme for our English sessions has been ‘The Local Area’ and as part of that we have had two very successful trips into Hanley. The first, in May, was to the Potteries Museum and the second, more recently, was to the City Central Library. 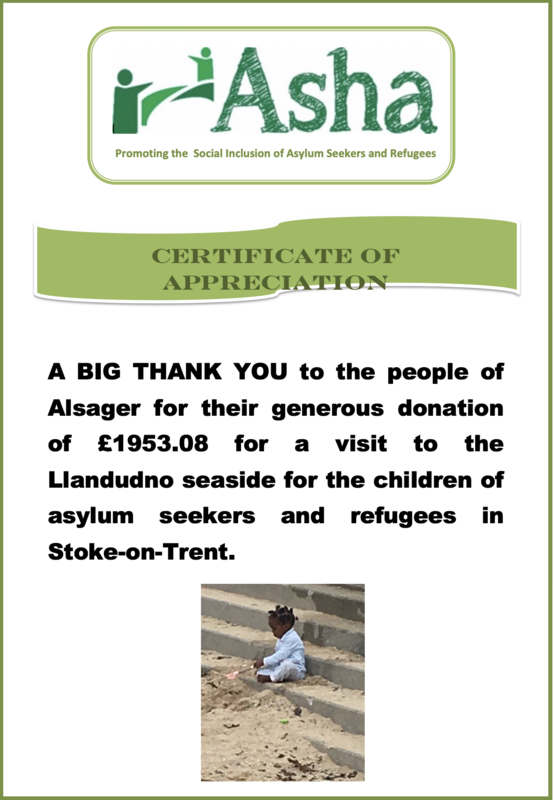 On each trip we had over 15 asylum seekers, both men and women as well as babies in pushchairs! None of them had visited the museum before and only a few had been to the Library, so it was a great opportunity to show everyone the excellent facilities which are available to them on their doorstep. After each trip we visited the Museum café for refreshments. Everyone was able to order their own drink and they enjoyed socialising with each other. One of our most enjoyable classroom based sessions took place after the Royal Wedding. Sue and I brought in photos of our weddings and encouraged everyone to describe weddings in their own country. A very lively discussion followed. Mobile phones were brought out to show photos and videos of wedding clothes and wedding parties and we were shown examples of dancing from places as far apart as Armenia and Venezuela. We also did a demonstration of English men dancing, much to everyone’s amusement! More recently, the group has been very interested in the World Cup. In our final session this week we held an extremely noisy and competitive ‘World Cup Quiz’ which the girls won! It has been very rewarding to how much progress the group has made in learning English and hopefully some of them will be able to join the Keele classes in September. We have also enjoyed seeing asylum seekers from a number of different countries and cultures learning to communicate with each other and, whatever their personal difficulties, having fun and laughing together. We have tremendous admiration for their optimism and resilience and look forward to working with them again in September.